Anchored by the May Lane, in the heart of the Rosemary District - the Bayside Club offers easy access to the world-class dining, shopping, and cultural amenities of downtown Sarasota. The BaySide Club includes 250 residential units, the exclusive BaySide Club, a rooftop sunset deck overlooking Sarasota Bay, a resort style pool, a Zen garden, a dog park, and a first floor restaurant and retail. As the first new hotel in the downtown core in over 75 years, the Client’s expectations were clear: provide a contemporary and vibrant experience that has not been seen in the city of Sarasota, Florida. Located on the corner of Ringling Boulevard and Palm Avenue within the HOYT Architects-designed One Palm tower, the Aloft Sarasota hotel is a hotspot for locals and tourists exploring downtown. Instead of a traditional, closed-off lobby, project designers opted for a more open, lounge-like floor plan with an attached outdoor patio and urban courtyard. This open concept incorporates flexible interior spaces which can be adapted based on time of day and activities; allowing the space to serve as a laid-back coffee shop in the morning or an energized cocktail bar after hours. The outdoor patio area is open to the public during bar hours and includes two fire pits, several seating areas, and a large white wall for laser light shows and movie screenings. All of the Aloft Sarasota's prominent design features- from the bold and expressive color combinations, to its hip and savvy custom furnishings - work together to create a fun and wholly unique experience for visitors and hotel guests. The Hyatt Regency in Sarasota, Florida hotel expansion included integrating a 6,000 SF “L-shaped" ballroom into the existing 10,000 SF rectangular ballroom. The new space is connected to the main hotel lobby to create a smooth flow of circulation throughout the hotel. The pre-function area features a modern, curvilinear ceiling, upgraded bathrooms, and a new drop-off area that improves traffic circulation. The Sarasota Modern urban boutique hotel is located adjacent to the downtown core in Sarasota, Florida’s emerging Rosemary District. Truly an oasis near downtown, the Sarasota Modern hotel boasts state-of-the-art amenities including a luxury spa, upscale bar, and fitness studio. 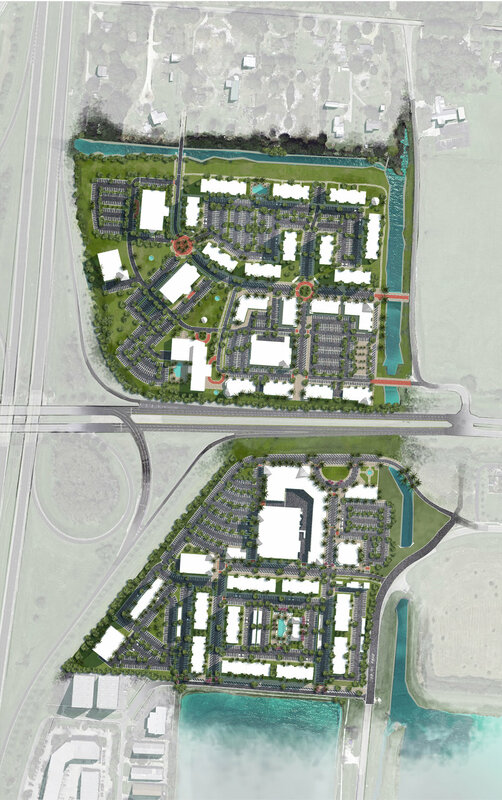 This mixed-use project will become a key feature of a new-urban, lifestyle center located at I-75 and Fruitville Road in Sarasota County, Florida. The project will include 100,000 SF of retail, a 130 key hotel, and 100,000 SF of office space- all designed around a centrally-located civic space. There is a new design-led addition to Washington D.C.’s five-star hotel scene. This 100-key boutique escape is situated in an overall mixed-use development of 1000+ residential units and offers guests a seductive, upscale lodging experience featuring many special touches from the minute you check in. Upon entering the lobby, guests are immersed in the warmth of the space. At first glance, the indirect lighting peeks out from behind architectural coves in the ceiling, slender niches within the marble wall and tiny tunnels within the floor to wash each surface in a subtle glow. Organic details like the exquisite oak paneling on the walls and columns and the lush walls of greenery adjacent to the lobby bar act to juxtapose the minimal-yet-luxurious honed marble reception desk and feature wall beyond. The furnishings were artfully curated to compliment the muted architectural finishes and include flax linen draperies, sculptural hide-wrapped stools and chiseled limestone tabletops. From the second-story mezzanine to the elegant ballroom or cozy lobby and bar, this hidden gem’s sleek, natural finishes and gentle lighting scheme imbue the space with a sense of intimacy and repose that draws a refined clientele. Located on Cocoanut Avenue in Downtown Sarasota, Florida, this 10-story 150 key hotel is a unique hotel under the Hampton flag. Outstanding features include a rooftop pool and bar, 3,000 SF of meeting space, and waterside views of Sarasota Bay. Merging the power of design, with the immediacy of artistic visualization, the urban analog design process combines the diverse professional skills of HOYT Architecture Lab's in-house urban designers, architects, urban planners, digital artists, game-engine programmers, and software engineers. The outcome of this collaboration is the development of a powerful, precision-based 3D model which seamlessly incorporates the rigor of building, into the art of design. Equipped with a virtual reality headset and hand-held controllers, Summerhill project designers and stakeholders were able to walk, glide, and fly through imagined urban spaces in real-time virtual reality. This degree of immersion transfers designed ideas from a static page, into an active and continuously evolving 3D experience. The ability to not only illustrate and visualize designs, but to manipulate them in real-time virtual reality, allowed HOYT Architects to develop a unified and highly successful design solution.